Joe Lenhard is a volunteer team leader who served when Samaritan’s Purse responded to a tornado that hit Vilonia, Arkansas, in late April. When I met Ginger, she couldn’t help but apologize for the condition of her yard, which was massively overgrown in addition to the tornado debris and other refuse everywhere. While Ginger’s house was still standing, it had been on the edge of the tornado’s path in Vilonia, Arkansas. In addition to the recent storm, this area was hit by a twister three years ago. That one caused extensive damage that Ginger hadn’t entirely dealt with because she slipped into a deep depression and, as a result, let her property go. Ginger said she had been climbing out of the depression only recently. But now with this new damage, I could see fear in her eyes and wondered if she was anticipating the depression returning in the aftermath of this storm. 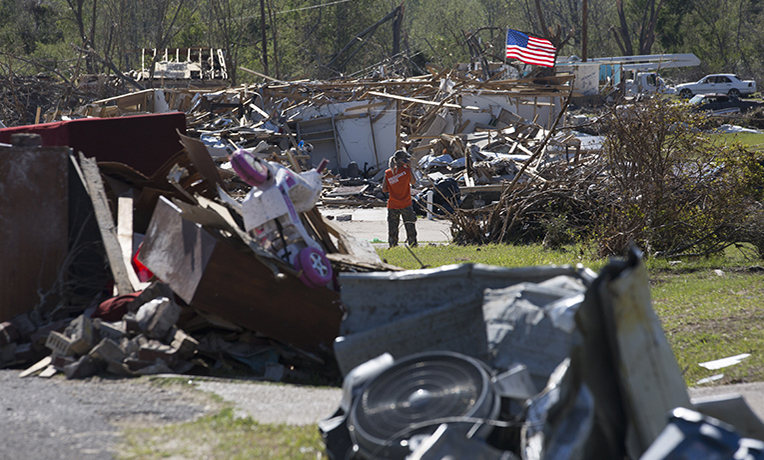 During late April, storms swept across the U.S., killing at least 36 people. As she showed me her property, she started to weep. The hurt Ginger felt was deeper than just the tornado damage. She had been told by people from a church she attended that God would not forgive her for some of the things that she had done in her life, so she did not have much hope. I realized how much she needed to feel God’s love in a tangible way, and I hoped that as our volunteers came in to help, He would begin to soften her heart. After the initial yard assessment, I walked back to where I parked my van and asked her if I could pray with her. She agreed, and I prayed that God would give her peace, let her feel His love, and strengthen her. When she began to cry, I assured her that God was with her in all of this. She told me that she was pretty sure that was true because she somehow knew God was protecting her when her roof almost blew off. Her burn pile, left unattended as we talked, had spread across her lawn and was rapidly approaching her house. The grass was so high and dried out everywhere that it was spreading quickly. She grabbed a rake and started beating it back to stop it from going any further. I ran out of the car and found another rake. Then I heard a slight hissing sound. I looked down and saw that the grass I was beating on had some gas cylinders strewn about. “Ginger? Are these cylinders GAS?” I asked frantically. 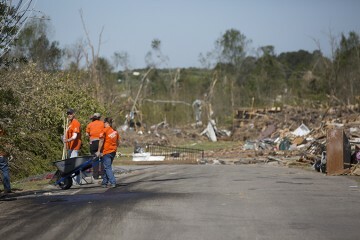 Samaritan’s Purse sent staff to five locations in Arkansas, Alabama, Kansas, and Mississippi. She confirmed that there were several gas and oxygen cylinders that someone had given her to recycle, but they were not quite empty. 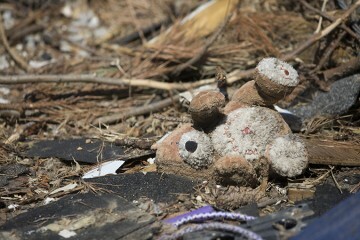 She had them stored in a shed that had been taken by the recent tornado. There were 12 tanks surrounding us that the fire was approaching. I yelled at her to get back. If any of them blew, it would certainly injure us. “Do you have a hose?” I asked. She ran to the corner of the house to turn her hose on, and I worked to untangle it. Within a few minutes, we had the fire under control, and I prepared to leave again. Ginger was seeing how God was continuing to protect her. 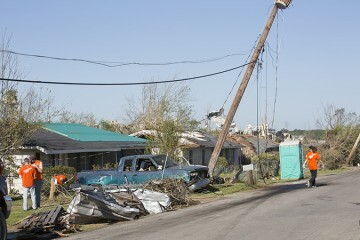 The next day, I took a team from Fellowship Baptist Church to Ginger’s house to continue working on the cleanup. Before we left, I shared with them the story of what happened with Ginger the day before and asked them all to love on her as they worked. We brought weed whackers to clear the high grass in her yard. The hearts and attitudes of the team members were a tremendous blessing to Ginger, and she said over and over again how shocked she was that anyone would go to so much trouble for her. We had about 35 people surrounding her house, loving on her and reclaiming the territory that the grass and depression had stolen from her. Many times throughout the day, a different member from the team took time to talk to her. Several of the girls cleaned out a cactus/flower bed that was overgrown with weeds around one of her trees. They found small stones all around the yard and landscaped it to make it look new and fresh. When Ginger saw it, she cried. That whole day was spent showing her the love of Jesus, so when the chaplains came, Ginger was ready. They led her to the Lord, and Ginger gave her heart to Jesus! By the time we finished, Ginger’s property was unrecognizable, and so was Ginger. The yard was mowed and clean, and the team separated everything into piles to burn and piles to be recycled. The people from Fellowship Baptist Church went a step further and worked to make arrangements to pick her up so she could join them for service at their church. Ginger still faces a battle with depression, but because of the storm, she not only met Jesus, but she also met a church family to support her.